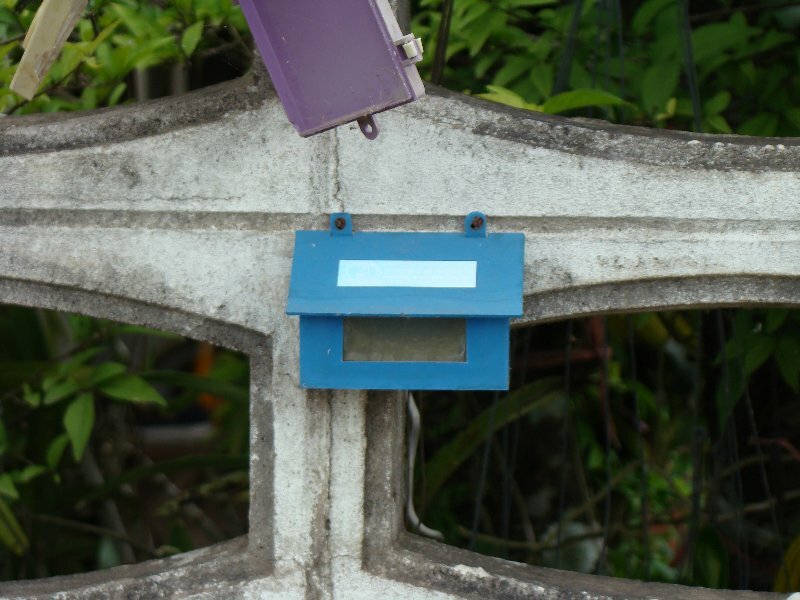 If you’ve spent any time in Thailand you’ve noticed these little blue mail boxes next to the regular mail box on a house or a driveway gate. I wondered for a while what they might be for…what possibly could be be so small and need it’s own box? 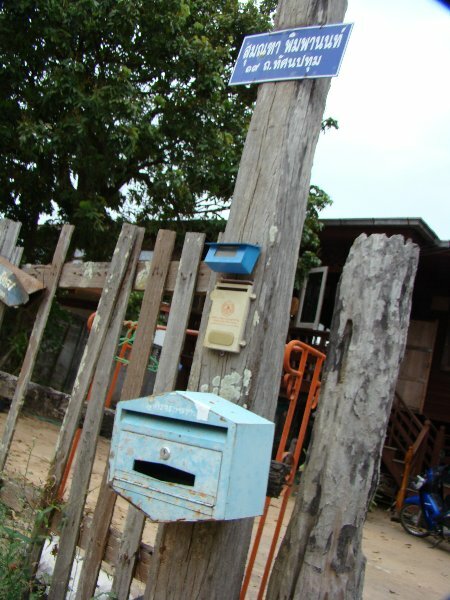 I was determined not to ask and find out on my own, which I did one day while walking through Nakhon Phanom. Do you know what the little blue box is for? 10 points will be given for a correct answer…100,000 points gets you a stuffed bunny. Just a quickie today as the back end of the blog needs a serious spring cleaning and seeing that it’s July it’s a just a little past due. 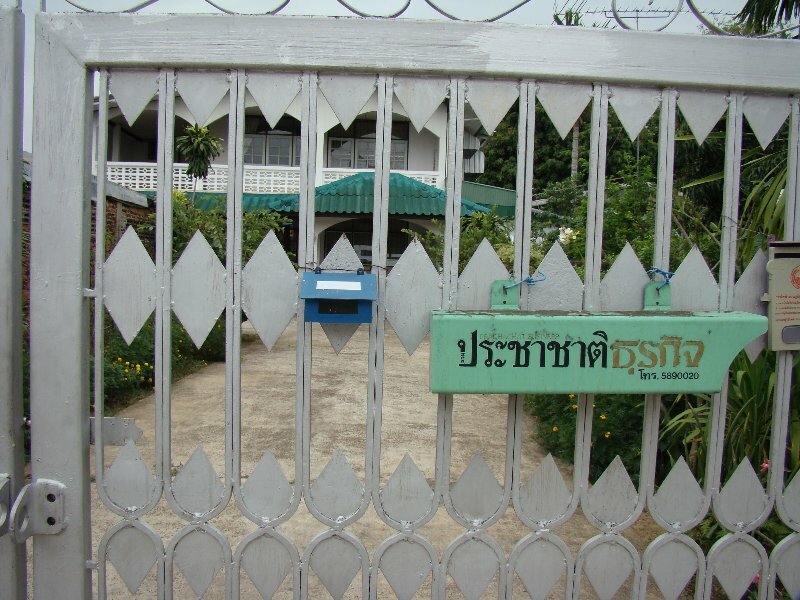 I’ll be back tomorrow to relate the Thai families housing tale and how they came to live in 2 provinces at once. And the winner is Malcolm from Retired in Thailand and Loving it. 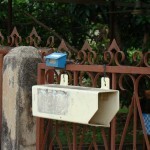 It is indeed a tiny mailbox for the water bill. Mike knew as well and was dead on when he said the bill usually ends up anywhere else but in the box. 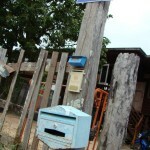 If you look close in the first picture below you’ll see another tiny mailbox that is beige…apparently that is for the electricity bill in Nakhon Phanom. If its like mine it makes a great home for gecko’s since the person who is supposed to use it usually sticks the delivery in the gate! I’ve yet to see the box used myself Mike. The bill is usually stuffed in the gates. You are correct sir but then again how could you be wrong when you have one. Oh! I love these types of posts as I always learn something new. And this is a totally new one on me as, except for my first months in Thailand, I’ve always lived condo. I have no idea myself. I would have got it wrong because I was going to guess at returned letters. In Wilai’s village a lady armed with a big book comes and collects the electric bill money and the same goes with the water bill. I’m pretty sure her village has no blue boxes. © Copyright Thailand Land of Smiles 2007-2009. All rights reserved.